There’s an eclectic mix of chefs and restaurateurs from around the UK and abroad who have set-up in London, opening their doors to eager diners, and we at Dot London HQ get very excited when we see them using a Dot London web address. It shows that they like to shout about where their restaurant is based and are embracing London’s reputation as a culinary capital. Here’s our selection of some of the top restaurateurs and chefs who are using the capital’s domain name. Chef Andrew Clarke and chef-restaurateur Jackson Boxer are partnering on their third collaboration, the Hebridean inspired seafood restaurant Orasay, which will open in Notting Hill in early 2019. The pair have in the past teamed up with their British cuisine inspired Brunswick House near Vauxhall, which is set in a former Georgian mansion house, and then St Leonards in Shoreditch, which is a grill restaurant inspired by both West Sussex and the southwest of France. Conceived by French master chef Pierre Gagnaire and restaurateur Mourad Mazouz, Sketch is a dining experience that pleases all of the senses, serving Michelin-starred food in breathtaking surroundings that includes original artwork by renowned artist David Shirgley. Freak Scene started as a pop-up in Farringdon has become a Soho must-visit hotspot. The restaurant was opened by celebrated Australian chef Scott Hallsworth, former head chef of Nobu, who has used his Asian cuisine know-how to create this informal eaterie that delights it’s diners with delectable curious Asian plates. Stevie Parle was a pioneer of the ‘pop-up’ movement, was named Young Chef of the Year in 2010 and in 2014 he formed Stevie Parle Restaurants with business partner Liam Nelson. Together they run five sites, including Islington-based Sardine, which focuses on Southern French cuisine, Clerkenwell-based Palatino that focuses on Italian food originating from Rome, and Pastaio, a pasta-centric no reservations restaurant in Soho. The prolific Australian chef Brett Redman and stylist Margaret Crow are the masterminds behind the new eclectic seafood restaurant Neptune, which can be found in Bloomsbury-based Kimpton Fitzroy London hotel. 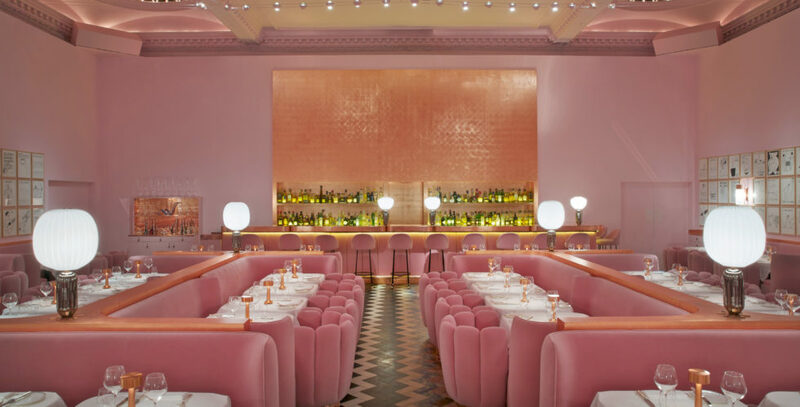 The restaurant has a contemporary setting within a Grade II-listed building, featuring a 30-seater oyster bar and a rolling exhibition of artists that decorate the walls. Juan Santa Cruz is the restaurateur and designer behind London hotspots Casa Cruz in Notting Hill and Isabel in Mayfair, and has recently applied his skills to deli dining with his new venture Nathalie. This Mayfair-based venue’s menu changes twice a day, serving raw and vegan dishes and priding itself on having sustainable takeaway containers.